Alexios II Komnenos or Alexius II Comnenus (Greek: Αλέξιος Β’ Κομνηνός, Alexios II Komnēnos) (10 September 1169 – October 1183) was Byzantine emperor from 1180 to 1183. He was the son of Emperor Manuel I Komnenos and Maria, daughter of Raymond, prince of Antioch. He was the long-awaited male heir and was named Alexius as a fulfilment of the AIMA prophecy. ↑ An alternative date of birth occasionally given is 1168 (van Dieten 1975, p. 169), based on William of Tyre's statement that Alexios was 13 in 1180. For discussion, concluding that 14 September 1169 is correct, see (Wirth 1956); (Magoulias 1984, p. 383). This article incorporates text from a publication now in the public domain: Chisholm, Hugh, ed. (1911). 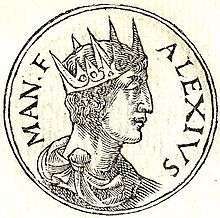 "Alexius II.". Encyclopædia Britannica (11th ed.). Cambridge University Press.